OA Digital are pleased to announce that we have now begun offering comprehensive mobile data capture and review software for Android powered handheld devices and your choice of database back-ends. This service enables field workers to collect a variety of data, synchronise it with a central database and review records or amendments produced by others. Such a service is particularly suitable for data collection and review, but can also be integrated into process management systems and mobile GIS applications. We provide a version of Imperial College London's EpiCollect software customised to your mobile data collection and review needs; the application already supports data collection in fields of your choice, photographic recording and GPS location tagging. Further features can be added to the software, providing a range of possible services. We ensure that the application synchronises with your existing data infrastructure, or with a system designed to meet your needs. We will also be pleased to discuss hosting arrangements for you if your infrastructure is not suitable for the task. Please contact us if you would like to discuss the possibilities of our mobile recording system. OA Digital staff have a proven track record in mobile deployment, GIS application development and database design and maintenance; we are more than happy to discuss leveraging these skills for your next mobile application. We have been supporting and advocating the open source gvSIG desktop client for a while now. And so has the Department of Environment and Health at the city of Munich who have just released their guide to using gvSIG 1.9 (in German). 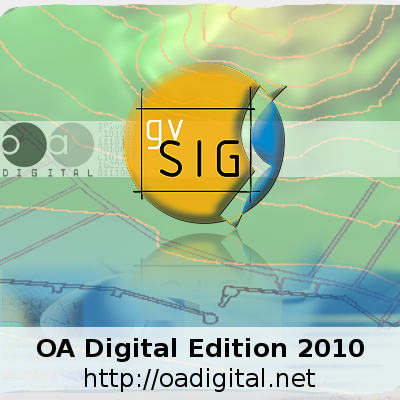 It's based on the OA Digital Quickstart Guide and updated to cover new features in the upcoming version of gvSIG. This just goes to show how much more efficient things get when you do them the Open Access way. A big cheers to Munich, city of great beer and open source GIS. While we are preparing the final release of gvSIG OADE 2010, we have decided to release a 2nd Beta version of the software. This is so that users can immediately benefit from a number of important bug fixes and enhancements done since the release of the 1st Beta version. Among the most critical are a number of bug fixes in the raster data engine and the ability to run on Windows 7. Please see our release page for more details. We recommend all users to update their gvSIG installations to Beta 2. OA Digital have an article in the June 2009 edition of GeoConnexions International Magazine. In the "Open Sources" column, we talk about our work at Oxford Archaeology. The article is freely available to download in pdf format here. Previous editions of the "Open Sources" column can be found, along with future planned editions, at the Open Source Geospatial Foundation wiki.